A thumping across the rooftops at midnight. A soft whistle on the night air. You search in the morning for your nighttime visitor and find…nothing. A spirit on the wind? Close—it was a flying squirrel. Active at night, flying squirrels glide from tree to tree. They climb high up a trunk and leap off, stretching out their arms and legs. A fold of skin running from wrist to ankle acts like a magic carpet, carrying the rodent 150 feet or more. Then, using its flat tail as a rudder and brake, it swoops upward to land on the next tree. Many people have never seen these nocturnal creatures (except on TV), and think they are rare. 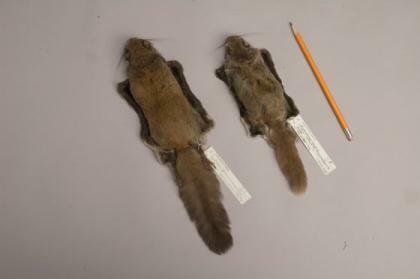 In fact, flying squirrels are quite common in North America, and in some areas may outnumber the more familiar gray squirrel. Two squirrels for the price of one!